1. Clinical results. In the case of the patients, the decrease between arrival and discharge scores to global depression, psychomotor retardation and anxiety rating scales, shows an improvement of at least 50% (Table 1) and fulfils the remission clinical criteria. Furthermore, scores to mood-assessment scales indicate an attenuation of the depressive mood (Fig. 2). 2. 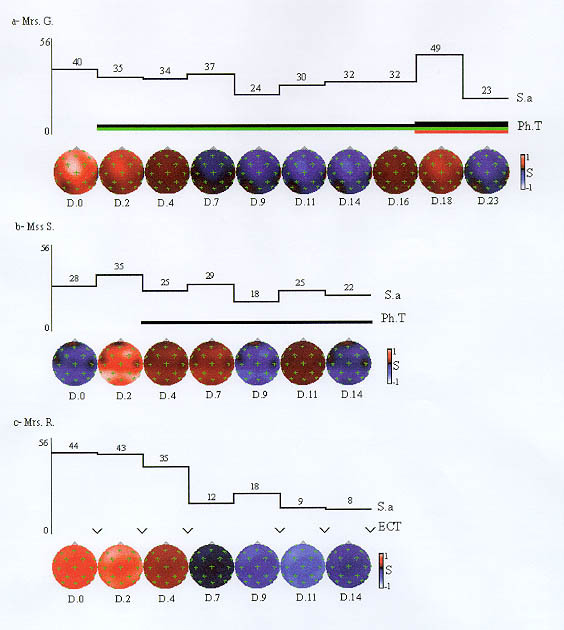 Electrophysiological results For each subject, surrogate data test ensures the presence of non-linear processes in EEG-signals and thus justifies the use of non-linear methods for EEG-quantification. For the patients, averaged global entropy depicts an important significant correlation with the mood modulation (see Fig. 1). For the control subject (Mrs. I. ), this index does not co-vary with her mood. Fig. 1 : Longitudinal variation of global entropy (K) and scores to mood assessment scale for each subject. Entropy evolution is represented with open circles, and corresponds to the left ordinate axis scale. Depressive mood modulation is depicted with black squares and corresponds to the right ordinate axis scale. Days of recording are given in abscissa. Depressed patients : Mrs. G., Mss. S. and Mrs. R.
In order to approach the neuronal changes involved in the clinical improvement, we proceed to PCA decomposition on the entropy maps data sets. For each subject, the first two principal components were selected. 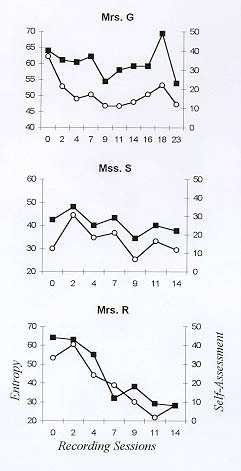 Their loadings present two different patterns : (1) the first principal component corresponds, for all the subjects, to an overall level of complexity equidistributed over the scalp and (2) the second principal component depicts different patterns between the control subject and the depressed patients : the frontal electrodes have important loadings in the control subject whereas they have low ones in the depressed patients. On the basis of the strong and significant correlation observed between the global entropy and mood scores for the patients only, we used the principal components to study, in their case, the correspondence between the spatio-temporal brain dynamics complexity and depressive mood along the recording sessions. For the patients, the evolution of the two main principal components scores along the recordings session is different : the first component scores co-vary with mood whereas the second component ones do not. The evolution of the first component reveals the daily modulation of brain dynamics (Fig. 2) : it represents the global level of the dynamics' complexity and can thus be compared to K. Moreover, in the case of Mrs. R., a drastic change in the global level of brain dynamics' complexity between day 4 and day 7 is associated with a clear drop in the mood assessment score. This phenomenon can be interpreted as a bifurcation (see Fig. 2c) and can also be noticed in the other patients. The evolution of the second spatial mode scores does not depict any significant correlation with mood assessment scores. This component is thus not directly associated with mood improvement. Fig. 2 : Evolution of self-assessment scores (S.a.), treatments (Ph.T. : pharmacological ; ECT : electroconvulsive therapy) and first principal component scores (S) along therapy for each patient. (a) : Mrs. G. was treated with an anti-depressant (black line : citalopram, 20mg/day from day 1 to day 16 and 40mg/day after), anxiolytic (green line : alprazolam, 20mg/day) and a hypnotic (red line : cyamemazine 25mg/day). (b) : Mss S. was treated with an anti-depressant (black line : clomipramine 150 mg/day). (c) : Mrs. R.'s ECT sessions are represented by V signs.